North Berwick Golf Club is the 13th oldest club in the world, and boasts a fantastic links golf course which begins in the town, and stretches to the West along the spectacular coastline. Price based on two sharing twin/double room! 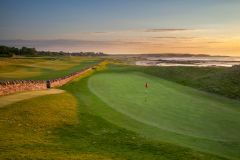 The West Links championship course has hosted final qualifying for the Open Championship in recent years, and is a links in the traditional sense; golfers must negotiate deep, revetted pot-bunkers, blind drives and devilish burns. There are more than a few holes that stand out at North Berwick, but the most notable may be the 14th and 15th. The former is named ‘Perfection', apparently because it takes two perfect shots to master it. It may also have something to do with the views over the Bass Rock, which sits imposingly in the Firth of Forth, and is home to the world's largest gannet population. The 15th, ‘Redan', is the classic par-3 which has reputedly been the subject of a number of copies in modern golf course design, featuring a vast hidden gully front-right of the green. Packed-full of character, North Berwick is a classic Scottish links. A - No visitor tee times available after 12:30 on the weekend.